Gordy Hoffman leads a seminar on the topic of using dialogue for story development in the University Center. For 16 aspiring screenwriters and playwrights, the topics were tantalizing: How to tell a powerful story. How to create characters to whom audiences attach. How to weave dramatic elements into a compelling tale. Point Park's newest community of writers explored all of that and more as part of the University's first-ever low-residency M.F.A. in screenwriting and playwriting program, which began with an on-campus residency Aug. 3-8. 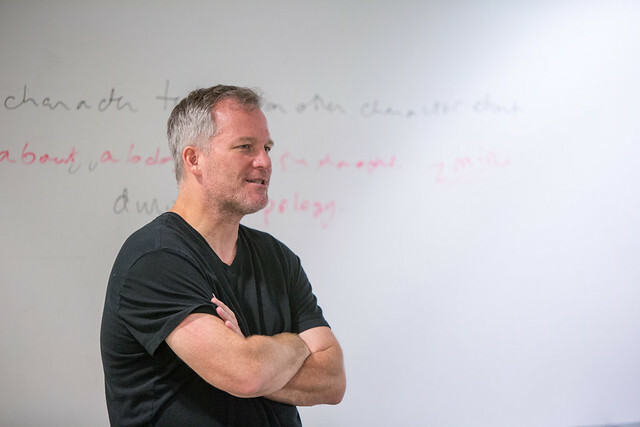 During the week, students attended workshops with writer and director Gordy Hoffman, screenwriter Rob Lieber and playwright Tammy Ryan, crafted their own pieces, and then shared their works with the group. "I am honored to be one of the first to participate in Point Park's low-residency M.F.A. program. Becoming a writer is something that I could only dream about; it's so great to finally make my dreams become a reality. The program is going to be a lot of work, but I'm looking forward to it." - Alan Stevens, Greenville, Pa.
"The first M.F.A. class is a diverse, well-versed group that is brimming with talent and ideas. It is an even spread between those that want to write for the screen and stage and a wonderful geographic mix of people from the Northeast. We all bonded quickly and I know their diverse backgrounds, interesting stories, and most importantly, diversity of psychology will help elevate them as students and working professional writers." - Nelson Chipman, graduate program director and assistant professor. "I was very attracted to Point Park's M.F.A. program because of the low-residency aspect and the fact that it is aimed at working professionals. I hope to improve my skill set, create a dynamic portfolio and learn how to navigate the writing landscape." - Robin Fusco, Sunnyside, N.Y.
"Wow, this was a talented, energetic and committed group of writers! I was blown away by their life experiences, the stories they want to tell and their commitments to telling them. My favorite moment from the week was the last day when we read out loud all of their scripts. It was so powerful." - Elise D'Haene, adjunct instructor. "Gordy Hoffman struck me as a truth seeker. An artist that understands that truth in story gives it power. Being a part of the community of the Conservatory of Performing Arts is a large asset that we as writers have. The ability to draw from a pool of such talented performers when a piece that we authored, is produced, can make that difference." - Lorenzo Boone, Pittsburgh, Pa.
"Throughout the course of this residency, we were visited by several terrific guests, like playwright Tammy Ryan and screenwriters Gordy Hoffman and Rob Lieber. They all fortuitously echoed our own urgings to the group: to write deep and to develop a willingness to be emotionally uncomfortable in order to create honest, relatable, meaningful work." - Molly Rice, adjunct instructor. Students will complete online courses during the fall and spring semesters and return to campus for the second low-residency program, July 28 through Aug. 8, 2015. "Point Park University's New Low-Residency M.F.A. Program Attracts Students from Around the World," Pop City, Sept. 10, 2014.